It’s great, isn’t it ? What goes around, comes around, and this season it appears the nineties are back. So … um … baggy jeans and glowsticks ahoy, I take it ? Well, apparently not … it’s all about sportswear, actually. Stella McCartney’s been busy with adidas, designing a new range of functional – yet beautiful – workout gear so you can look good while you sweat. Yeah, like that’s gonna work. By my calculations, I estimate 90% of the collection will never be worn in a gym … and when I say calculations, I do mean that. I carried out some research in Shirley High Street, just by the newly opened Easy Gym and counted more sportswear garments in the adjacent Wetherspoon’s than I saw actually entering or leaving the fitness studio. There were a lot more people in the pub, too, and a fair few visiting both. Still, everything in moderation, eh ? One thing that the infamous “Mutant Mile” did confirm for me is that stilettos are still in fashion. I read this week that they’ve actually never gone out of fashion, with all the major labels still creating and producing them in their thousands. Long may that trend continue as I’m a big fan, personally … not of wearing them, I hasten to add, but of admiring those who do. 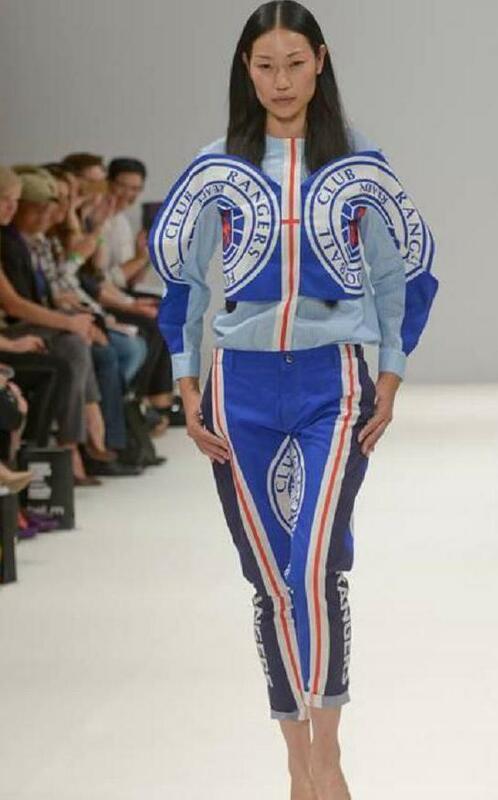 Football is never far from my mind so the combination of our glorious national sport with up-to-the-minute designer styling was a welcome distraction as I heard about a new “Rangers Dress” on the radio whilst driving home yesterday. I say “daring” because I think she must have been pretty brave to have asked her now husband about it in the first place. But, when you come to think about it, it’s one hell of a loving tribute both to the man himself and Manchester City Football Club. At the risk of sounding like an old perv, my favourite piece of fashion news this week came from the pert bottom of Paloma Faith. It seems like transparent and translucent materials are very much the in-thing for next season, and the quirky singer was leading the charge by sitting in the front row at this year’s Burberry show wearing the rather fetching bronze skirt pictured above. The only slightly worrying thing about that is that … how can I put this … you know how most models are quite slim and rather beautiful … well, I’m just wondering what it’s gonna be like on Shirley High Street on New Year’s Eve … I doubt we’ll see much in the way of sportswear, anyway, so that’s a relief I suppose. This entry was posted in blogging, Fashion, football, Life, Media and tagged adidas, Cancer Recovery, Chiswick, David Bowie, Easy Gym, Easy Jet, Fashion, Foster's, London Fashion Week, nike, reebok, Stella McCartney, Top Hat Cleaners, Wetherspoon's by rigger67. Bookmark the permalink.